China’s rise adds to a growing list of reasons to ratify the U.N. Convention on the Law of the Sea. Senate ratification of the treaty, which sets out a legal framework for conduct in the world’s oceans, will put the United States in an even stronger position to preserve our freedom of navigation in the South and East China Seas against any potential Chinese attempts to restrict our access, now and in the future. It will also allow us to be an even more forceful advocate for a rules-based process when it comes to territorial disputes in those waters and will lend Washington more credibility as it pushes China to follow international laws and norms. Let’s start with that final reason. If the United States ratifies the Law of the Sea Convention, we will have more credibility when we argue that China needs to become a “responsible stakeholder”—in the words of former President George W. Bush’s Deputy Secretary of State Robert Zoellick—in the international system. More specifically, ratifying the Law of the Sea Convention will lock in the terms that are extremely favorable to America in our disputes with China over freedom of navigation in the South China Sea. We currently have regular disagreements with the Chinese over where America’s military assets can travel in the oceans near China’s shores. The Law of the Sea would address these issues because it explicitly lays out rules and definitions in ways that the United States helped shape when the convention was written. Under the convention, a coastal state’s “territorial waters” start from its nautical baseline—basically where the ocean hits the shore at low tide—and extends 12 nautical miles out to sea. The next zone, extending out to 200 nautical miles from shore, is the nation’s exclusive economic zone. 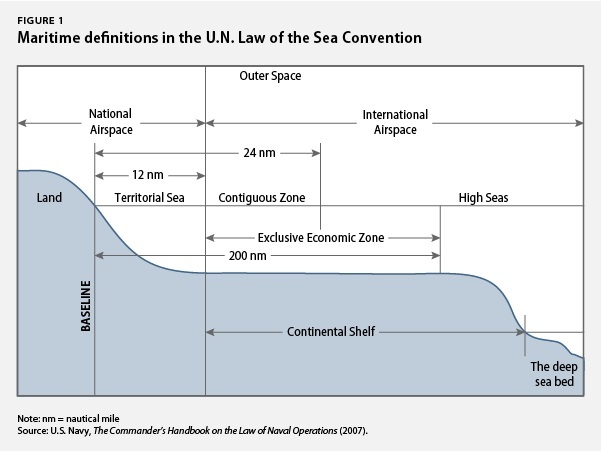 In this zone the coastal state has rights for the purposes of “exploring and exploiting, conserving and managing the natural resources, whether living or non-living.” Other countries have freedoms of “navigation and over-flight,” among others. Only the coastal state can therefore exploit its exclusive economic zone’s resources. But its domestic laws do not apply in the zone, and the coastal state cannot stop another country’s civilian or military ships from traveling through it. Finally, the United States will have a stronger hand when it comes to the other issues at play in the South China Sea if it ratifies Law of the Sea. The United States has strong interests there in freedom of navigation and the maintenance of peace and stability. Brunei, Cambodia, China, Indonesia, Malaysia, the Philippines, Singapore, Taiwan, Thailand, and Vietnam all have overlapping and conflicting claims over islands and shoals in the South China Sea—and thus over the substantial maritime rights that go along with them. While those disputes have been in the news lately with the standoff between the Philippines and China over the Scarborough Shoal, there are many similar contests. Huge food and energy resources are at stake. Fish stocks in the region are horribly depleted and badly managed, but there is soaring demand for fish from growing populations in neighboring countries with rising wealth and more appetite for animal protein. The South China Sea has nearly one-tenth of the world’s fisheries used for human consumption, which is impressive considering its relatively small size. Hostile incidents are on the rise, as fishing boats enter disputed waters more often in search of their quarry, backed (tacitly or not) by their governments. The stakes go even higher in terms of energy extraction. New technologies are now making it possible to explore and extract oil and natural gas from the deep ocean. And according to a recent report, the South China Sea likely “holds about 15.6 billion barrels of petroleum, of which about 1.6 billion barrels are recoverable.” Some Chinese estimates are higher by a factor of 10. The U.S. Geological Survey estimates that the seabed also holds nearly 300 trillion cubic feet of natural gas. These numbers are speculative, but even if they are partially accurate, they make the South China Sea a significant potential source for energy resources. There is also the possibility that China will shift its strategy. Many think, for example, that Beijing will walk away from its nine-dash claim because the Law of the Sea does not recognize most maritime claims based on history. Others suggest that they will somehow argue that the convention doesn’t apply in the South China Sea. The government of China is divided on this issue, and Beijing could choose to employ any number of other legal strategies. But no matter what, the United States and its partners can carefully and rationally push back on Beijing’s overreaching to the extent it occurs, if they are united in asserting that the Law of the Sea governs conduct in the world’s oceans. Some senators have voiced concerns about preserving American sovereignty when it comes to the convention. But as has been written before, rigid interpretations of sovereignty are a double-edged sword when it comes to China. These arguments let China assert that its currency, its climate policy, its development policies—all issues that affect us—are sovereign matters on which it should consider no other country’s concerns. Being in the strongest legal and diplomatic position we can with China is only one reason for America to sign on to Law of the Sea Convention. Also at stake is our ability to make claims on extended continental shelf areas in the Arctic and in other locales, and establish claims to deep-seabed regions that may contain deposits of rare-earth minerals. Beyond all the good policy reasons, though, when the U.S. Navy, U.S. Coast Guard, the Joint Chiefs of Staff, the U.S. Chamber of Commerce, Lockheed-Martin, the AFL-CIO, the World Wildlife Fund, the Natural Resources Defense Council, Oceana, AT&T, the American Petroleum Institute, ConocoPhillips, the United States Oil and Gas Association, the Boat Owners Association of the United States, former Presidents Bill Clinton and George W. Bush, Secretary Clinton, former Secretaries of State Condolezza Rice and Colin Powell, former Alaska Gov. Sarah Palin, and President Barack Obama all agree that America should do something, shouldn’t we just do it? 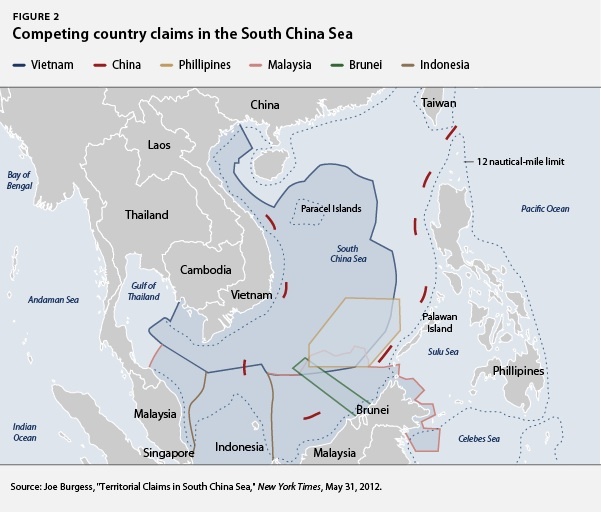 For a full analysis of China’s positions on the South China Sea, see Peter Dutton, “Three Disputes and Three Objectives: China and the South China Sea,” Naval War College Review 64 (4) (2011), available at http://www.usnwc.edu/getattachment/feb516bf-9d93-4d5c-80dc-d5073ad84d9b/Three-Disputes-and-Three-Objectives–China-and-the; Peter Dutton, “China’s Views of Sovereignty and Methods of Access Control,” Testimony before the U.S.-China Economic and Security Review Commission, February 27, 2008, available at http://www.uscc.gov/hearings/2008hearings/written_testimonies/08_02_27_wrts/08_02_27_dutton_statement.php. For more on U.S. interests in the South China Sea, see P. Cronin, ed. “Cooperation from Strength: The United States, China and the South China Sea”(Washington: Center for a New American Security), available at http://www.cnas.org/files/documents/publications/CNAS_CooperationFromStrength_Cronin_1.pdf. For more on China’s engagement in the international system generally, see Nina Hachigian, Winny Chen, and Christopher Beddor. “China’s New Engagement in the International System: In the Ring, but Punching Below its Weight” (Washington: Center for American Progress, 2009) available at http://www.americanprogress.org/issues/2009/11/chinas_new_engagement.html. For a discussion about the Chinese motivations for encounters at sea, see Oriana Skylar Mastro, “Signaling and Military Provocation in Chinese National Security Strategy: A Closer Look at the Impeccable Incident,” The Journal of Strategic Studies 34 (2): 219-244 available at http://www.tandfonline.com/doi/abs/10.1080/01402390.2011.559025#preview.